Meta Box Columns is an UI extension which helps you put custom fields into columns. The extension creates a 12-column grid and allows you to specify where a custom field should be. The concept of the extension is rather simple. But the power of this extension comes when you combine it with groups. So that you can create nested columns for sub-fields as well. You can also put multiple fields into one column if you want. For more information about the extension, please see the extension page. To specify number of columns for each field, simply add columns parameter for that field. 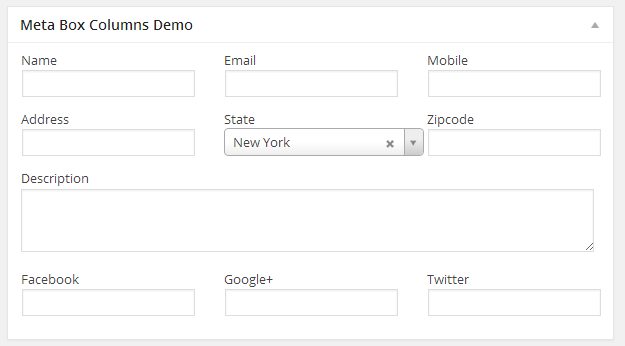 The plugin will automatically calculate number of columns and wrap fields into a div “row” and apply styles for them. The advanced syntax is helpful if you need to put multiple fields in 1 column. Then each field in the meta box need to specify which column it belongs to by setting 'column' => 'column-0'. This extension uses 12-columns grid, so when defining number of columns, you must define them so that the total columns for each row equals to 12.